It’s time again for the Taste of Home Cooking-hosted Recipe Swap! The theme for this round was Mexican, and I received this yummy recipe from Mary Ellen of Mary Ellen’s Cooking Creations. Now, you know I love a good taco, and anything with chiles in it is sure to be a winning recipe! One of the great things about chicken is it’s versatility and how quickly it (usually) cooks. I was able to cook this chicken to the point where it could be shredded in about 15 minutes, and it was ready to serve in about 20 minutes total. Easy peasy weeknight meal!! I love the crockpot, but being able to do a shredded meat taco that quickly is niiiiiice! Of course the flavors were phenomenal. I was out of queso fresco, so I used monterrey jack in it’s place – but next time I will definitely have the crumbly cheese! Thanks to Mary Ellen for a great new taco recipe, and be sure to check out the other submissions below! Place the chicken in a saute pan or pot. Add the spices and chicken broth. Bring to a boil then reduce to a medium simmer until cooked through, about 15 minutes. Transfer chicken to a cutting board to let rest for 5 minutes, then shred in a stand mixer or with 2 forks. Meanwhile, heat the olive oil in the (rinsed out) saute pan. Add onions, garlic, and peppers. Saute 3-4 minutes and then add the Rotel, cumin, chili powder, and lime juice. 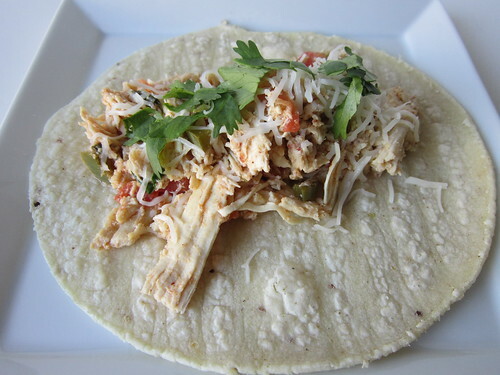 Bring to a simmer and add the shredded chicken and cilantro.Simmer until ready to serve. To serve, warm the tortillas and top with a couple of spoonfuls of the chicken mixture, crumbled cheese, and extra cilantro if you prefer. Give it a nice squeeze of lime juice, and enjoy!! sounds like a yummy taco or burrito filling! Sounds like a classic way to make chicken for tacos or enchiladas…yum!